She has so many sweetheart's wherever she does go. And when it is her Sunday out, oh , don't she do the grand. C stands for Caroline, she's a modest bit of stuff. and if you go to kiss her, she says, now that's enough. Mother says I musn't, father says I may. D stands far Dolly, she's a playful little lass. She likes to go to the park, and romp upon the gross. E stands for Emily, so quiet and so nice. F stands for Fanny, she likes a bit of chaff, [laugh. And when her young man tickles her, you should hear her. She never speaks to rubbish, nor Hops to see a crowd. H stands for Hannah, she's a girl to please the eye. They call her Lady Tiohborne, whenever she goes out. she would huddle you, and fondle you. and do you all your life. be dances to the organs, and delights to show her legs. Its daddy pays a crown a week, to find the baby pap. They say it takes her just an hour to put the beauty on. N stands for Nancy, she's got a funny nose. Who with her father's footman skedaddled right away. And dosen't think it naughty, to stay out after dark. R stands Rachel, she's getting very stout. She wears her Grecian bend in front, oh what's she been about. And when the supper it goes up, the Bobby he goes down. Her father is a tailor, and often on the loose. And like a hit of wax.work is in the window to be seen. She's one of those we read about, but very seldom sees. and if you haven't heard your name, you shall another than. My pretty, O my pretty Flora Bell. As I and Flora Bell. Poor slaves to buy and sell. And music was musing in the dell. I saw it was my Flora Bell. I raised her when she fell. Folding me unto her breast, mother kiss d me in my dream. But I feel I shall be gone ere there dawns another day. How I, knew no peace until mother kiss'd me in my dream. Three ballads. Young woman's A B C - first line reads: A stands for Annie, she's a pretty girl I know. 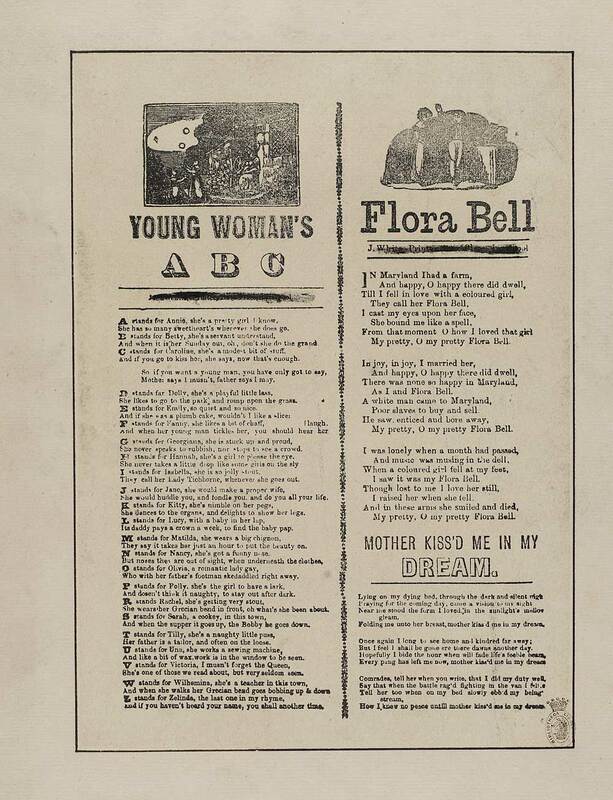 Flora Bell - first line reads: In Maryland I had a farm. Mother kiss'd me in my dream - first line reads: Lying on my dying bed, through the dark and silent night. In two columns with a woodcut above each. An attempt has been made to obliterate the imprint.